The Midwest is simply not in the picture when it comes to migration nationally. 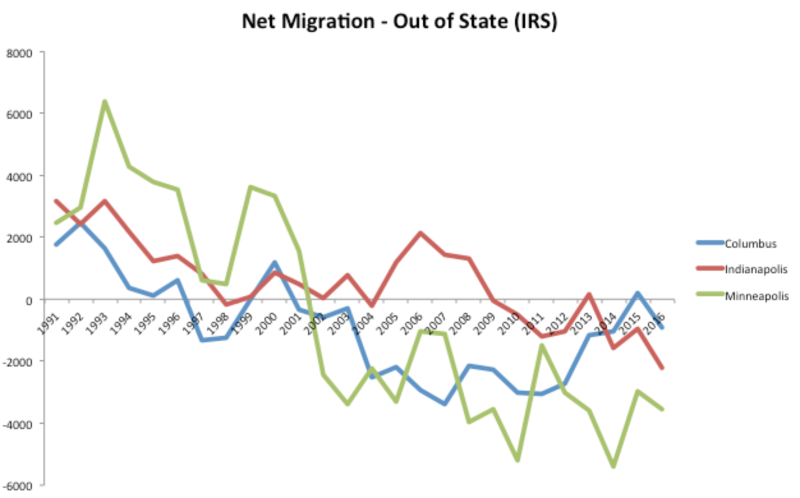 Even its best performing regions are often migration losers with the rest of the country. Columbus, Indianapolis, and Minneapolis-St. Paul all have growing populations, and basically healthy economies. Yet all of them are have net migration losses with the country when you look only at migration from out of state. The chart above is metro area migration as reported by the IRS county to county data, aggregated to the appropriate levels. The IRS changed their methodology in 2014 such that they report fewer records (for privacy purposes I believe). So the post-2013 period is not comparable. What we see here is a pretty stable level of in-migration with an actual peak up around 2011-2013. If I were looking for good news, that it where it would be. Interestingly, Columbus slightly out draws Indy from out of state on a pure in-migration basis. (Both cities draw as many or more in-migrants from in-state as they do from all other states combined). One case I find particularly of interest is California. California has significant net out-migration and many cities, including places Portland and Nashville have been feasting off the California exodus. (California is actually the #2 net exporter of people to Nashville after the rest of Tennessee). 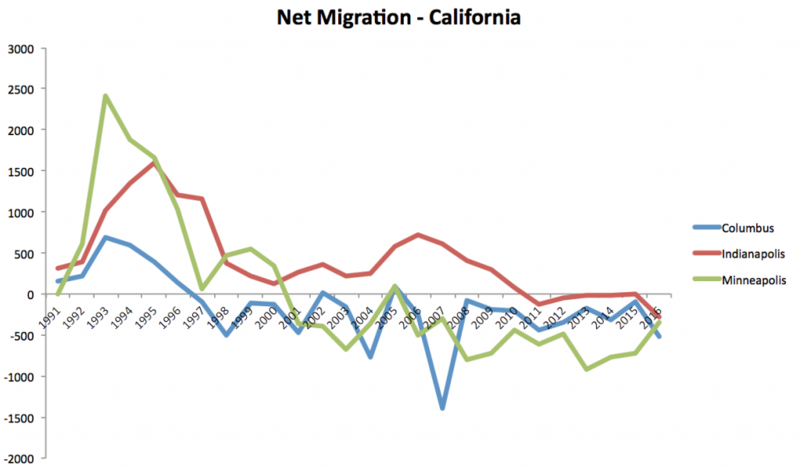 Here are how our three cities fare with California net migration. Again, all three are presently losers. And again they did better in the 90s (when Southern California in particular got slammed by the peace dividend). With California’s sky high housing prices and large scale net out-migration, the fact that these Midwest regions are actually losing people to California, even if a small number in Indy, is quite a feat. 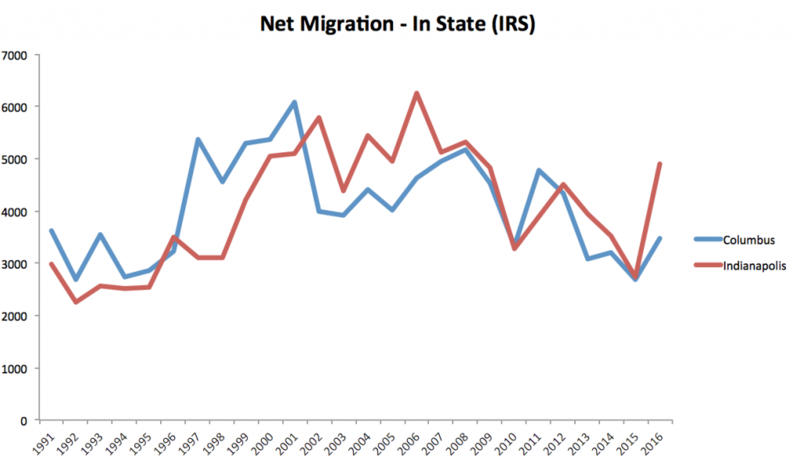 Now, migration loss to California is not necessarily bad. Depending on what’s going on, it could even be a good thing in the long run. If people are heading West to work in the tech industry, for example, that’s a form of up-skilling local residents, and even if they never return can build critical networks to Silicon Valley. Still, with the conditions so favorable for attracting California migrants and places like Austin and Nashville sucking in lots of them, I consider these Midwest city figures a negative indicator. I consider these numbers sobering news for these Midwest regions, and probably all the rest of them I didn’t look at as well, except possibly Chicago. In case you are wondering about in-state migration, here’s a chart of Indy and Columbus. You can see both have been feasting off in-state migration, and they have nearly identical charts. Minneapolis actually gets more of its in-migration from Wisconsin and Illinois than from Minnesota, probably because it has such a high percentage of the state’s population already and also is on a border and includes some Wisconsin counties in its metro area. So I exclude it from this chart. But this is also a good reminder that for all of these places, “out of state” includes next door neighbors, which account for a large share of out of state in-migration. This is only a blog post and looks mostly at the net migration. To get a more actionable sense of what’s going on, these regions should look at both in and out migration by origin and destination to see what’s happening at a granular level. Very interesting. Certainly lines up with my own purely anectodal observations from traveling around rural Indiana over the last 20+ years. The hinterlands are emptying out. So many small factories that once kept little towns afloat are now shuttered. Quaint main streets lined with empty storefronts that seem to mock the lightpole banners and potted flowers that bravely proclaim a message of hope at stark odds with observable reality. I can’t imagine what it must be like to try and sell a home in such places. Who will buy, and for how much? Those left behind often seem trapped and hopeless, surrounded by neglected and forlorn buildings that are gradually succumbing to the elements. But these charts seem to suggest that the emptying process is no longer limited to small towns. Even the larger cities in some states are bleeding people, and often those with the most valuable skills. It’s hard not to wonder where this will all end. A few giant megalopolii separated by vast robotically farmed areas, where most of the few remaining inhabitants will be state cabinet officials or U.S. Senators? IS that what these charts are suggesting? One has to wonder what the implications are for the Ohio, Indiana and Minnesota that they are now each dependent on a single metropolis for economic and social health. To the extent that there are opportunities for people in those states, the opportunities are in a single area rather than spread among many smaller towns. For Ohio, the state is lucky to have Columbus or it would be in free fall. On the other hand, if the state capital and major university were in say Cleveland perhaps northeast Ohio would be in decent shape. Indiana has more economic dynamism than you assume, particularly the northern region. Fort Wayne does not seem to be as bleak as implied. Certainly, Downtown Fort Wayne has seen some actual investment that is impressive. Even a cute farm-to-table restaurant in a brick building that would fit right into Portland or North Beach. Without heroin addicts waste and needles in every corner. Perhaps I’m missing it, but I don’t see anything about migration data in your link. In what ways have Cincinnati’s population and migration patterns surged in the last 2 years? Ithink Ohio is very different than Minnesota and Indiana. They each only have one large metro area, so that’s not so bad to have it hoovering up residents. In fact I would argue if would be a really bad sign if they didn’t. Ohio on the other hand has several major and minor metros, most y of which are doing poorly. That’s not good. Georgia is stagnant at best outside of Atlanta. It’s not unusual for one city to be the driver for a state. I’m not suggesting that should suffice, or to be content etc with it. I’m merely noting that not everything in the South is on fire. Midwest cities will lag in attraction until they get their attraction narrative down. Superstar cities can fulfill the ambition of the elite. Sun Belt cities attract people via lifestyle (weather, outdoor activities, slower pace) or affordability. Midwest cities have yet to identify their niche. I think the Midwest narrative is a combination of the ambition and affordability appeal, with a dose of DIY and independence and authenticity. But few cities have done it. Chicago definitely, Detroit and Cleveland are moving in that direction. I think that an ambition/affordability/DIY/independence appeal can definitely work for Chicago. I have some friends who bought a two family in Chicago, both with bougie, cultural type jobs, and they are DIY renovating one unit of the house at a time and should be able to pay a substantial portion of their rent. I cannot think of another metro that really presents those kinds of opportunities. Maybe many midwestern cities DON’T have a niche. If manufacturing is done in Asia and Mexico, maybe they really don’t have a future. Maybe Indy and Columbus are the exceptions that prove the rule and the rest will ‘right size’ to much smaller metros. Until a new kind of manufacturing-based economy emerges in the Midwest, they don’t have a niche. That’s the point. Cities like St. Louis and cincinnati are forms without a function. Asia and Mexico took their old one away from them. I would be curious to see the international migration numbers on top of this. I would suspect the numbers are far more favorable to each city — that, in fact, the international migration is more than making up for the domestic outflow. Interesting comments. It’s my experience, too. Even when something genuinely new happens in Cincinnati, the local elite go to great pains to make sure that no one realizes that it’s new. Stories about ‘holding fast to our local values’ and biographical pieces on the lines of ‘what I learned at St. Whatever’s is what made me who I am today.’ They seem to think that stories of change will undermine new things in Cincinnati. Maybe they’re right…maybe they aren’t. Why this midwestern fear of change and competition? Do you have any examples of something genuinely new happening in Cincinnati? Maybe there is more innovation happening there that simply never gets communicated to the outside world because the locals never communicate to the outside world. I mean things that are new to Cincinnati, not things that are entirely new to the world coming from Cincinnati. The latter doesn’t exist. These sites are the best for innovation in Cincinnati. Funny, I think Cincinnati sma Boston are a fascinating contrast. Boston is a highly parochial city, as is Cincinnati. They both have well defined cultures and an “old guard” ethic that seeks to protect this attitude. They both have strongest of an inflated sense of self worth ( The Hub vs. The Queen City). Yet somehow Boston managed to reinvent itself while Cincinnati has sory of cruises along essentially in the slow lane. I wonder if the difference was the coastal location of Boston, or the rediculous number of universities there. Both Boston and Cincinnati share a history of once being very important in their regions and then losing out to other cities. I think that’s the source of the “Inflated sense of self” (almost ludicrously so in Cincinnati’s case). It’s the survival of a cultural pattern established in the peak periods of each city. It survived in both cities because they’re declines were long and slow not sudden like Detroit. Still, if Boston can reinvent itself, so can Cincinnati. That doesn’t mean it will. I still see Cincinnati’s future as a regional cultural center a la New Orleans or Charleston with some staid banking and insurance operations and some eds and meds, but no aggressively competitive economic activity. Cincinnatians get visible frightened when you talk about people and companies competing with each other. Talk of winners and losers is shut down in Cincy across the board. I just can’t see cincinnati as a place where important new and expanding companies will emerge. Boston’s reinvention probably started in the 1970s and came to fruition in the last decade with the globalization of universities and the concentration of biotech in Boston. That’s 40 years. Cincinnati only even started to try to turn the corner about 7 or 8 years ago and is only even beginning to get real economic traction now. Cincinnati might have a rebirth by the 2040! Right at the moment the attraction is less than usual (fires are awful), but one reason I choose to stay in California is simply landscape and climate (as well as cultural ferment to some degree). I’m sorry, the flat plains outside my hometown (Fort Wayne), which I call “The Monsanto Prairie” are just not an interesting or appealing landscape. Especially not in February. I am an avid road cyclist (hobbyist, not racer), and there is just nothing all that interesting about the northeastern Indiana landscape. It can be pastoral and peaceful, but corn and soybeans are just not very appealing. Northeastern Indiana is just one part of the midwest. Very, very true. Cincinnati is certainly attractive from a landscape perspective. Heck, so is Bloomington. “pull the plug “! I hope that doesn’t mean what I think it does. You’re life is worth living! Don’t give up! These charts are interesting. I wonder if you can relate them to the growth or slowdown of tech jobs in these metros. 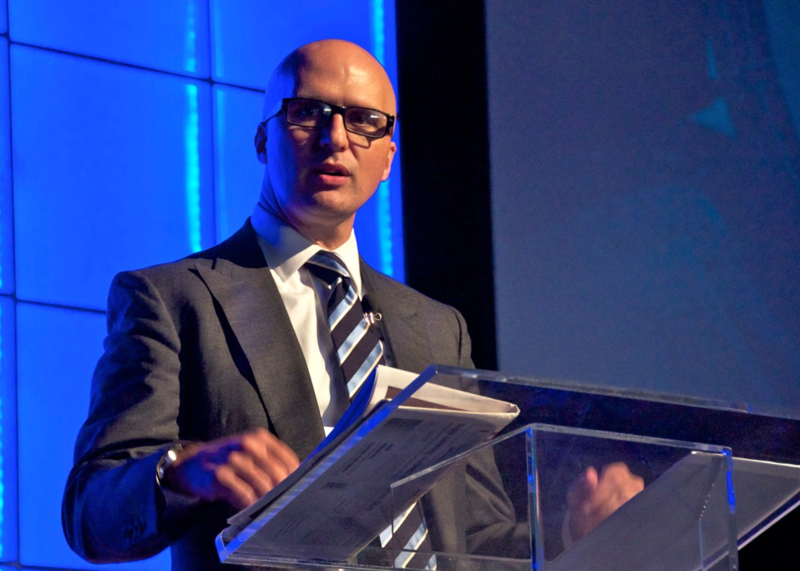 Indy seemed to have a boom about 10 years ago with Angie’s List and ExactTarget. Columbus is currently seeing a bit of a tech boom with CoverMyMeds, Root Insurance and A few other high growth companies. Columbus had a boom in the 90s when it was the home of CompuServe before they were bought by AOL. Maybe there’s a connection there with the patterns in the chart? Is there a sense in which this means it’s appropriate to characterize these cities as “stepping stones”? 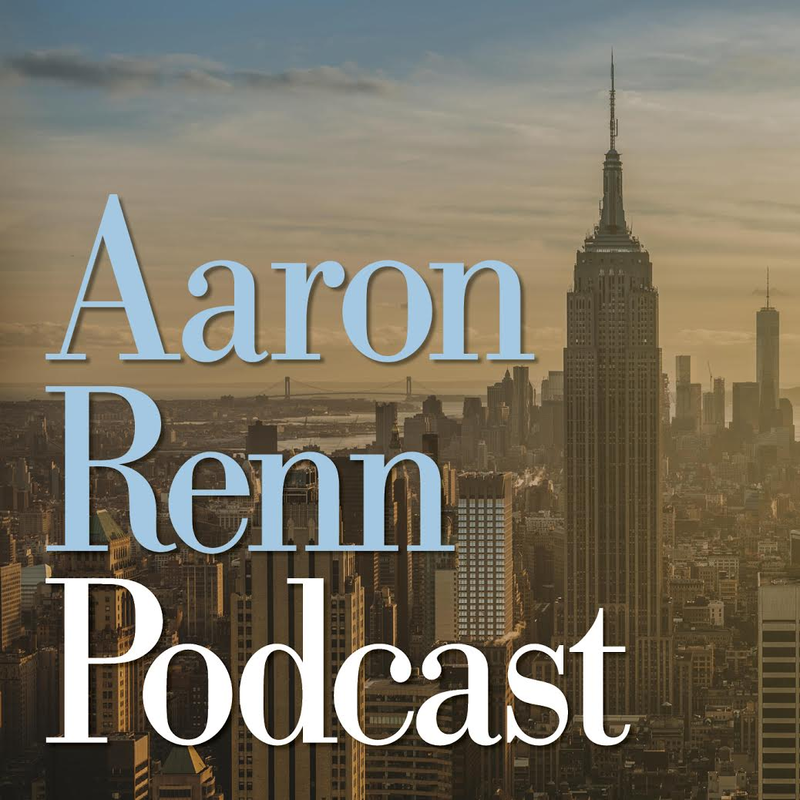 Someone grows up in another part of the state, moves to the capital city, and after getting a taste of its economic dynamism, they move up to an even more central city in the world economy? If they maintain their ties to their home state, this could still be helpful for bringing the state into the world economy. In Columbus, we used to joke that there was a conveyor belt moving gay men from Columbus to Chicago! The belt ran in both directions. I don’t know if this will be successful (probably not) but it is important for the rest of the country to know that the Midwest has a lot more variation between cities than many other regions. Minneapolis , Kansas city, and Chicago (and others) are all very very different from each other, but are just seen as “midwest” by the folks on the coast. I certainly agree with this. I think “midwest” has had negative connotations for a very, very long time. I have long advocated to label the region I live in as the “Great Lakes region”. I’d be very interested in the age breakdown of these out-migrants. I suspect that a large portion is due to retirement. As one reaches age 65, their likelihood of moving and the potential distance of these moves increases substantially. It shouldn’t be very surprising that a large number of retirees from aging states like Minnesota, Ohio, or Indiana would be moving out of state, especially to places with a warmer climate like California. I imagine the metro relationships with places in Arizona or Florida would show a similar trend. That is not to say that these three cities have nothing to worry about demographically. If the main driver of out-migration is young professionals or young families, then these places should be concerned. I don’t believe that this is the case. If the story is that older residents are retiring and moving south or west, then this out-migration story is likely sensationalized. What’s interesting is that the No. 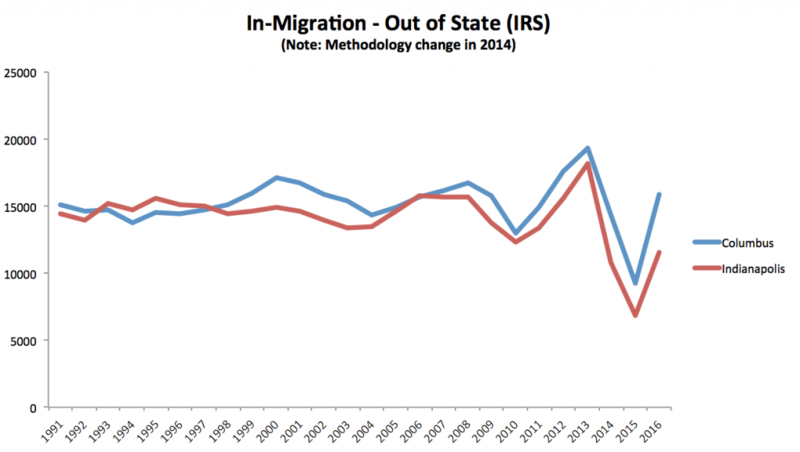 1 state for out-migration is Florida, while the No. 2 county is Maricopa (Phoenix), which may explain where retirees are going. Then again, the No. 1 state for in-migration is Florida, and the No. 2 county is Maricopa — are those seniors who had to move back in with their kids? By the way, the No. 1 county — for in- and out-migration — is Cook County (Chicago), Ill., which suggests — like the other locations — a lot of churn. Then again, only 1.7 percent of people moving in Ohio are coming from another state, and only 1.8 percent moving are leaving for another state. The No. 1 cause of population decline, really, is the death rate being higher than the birth rate. Wouldn’t a lack of international migration also play a role in the “Midwest’s” demographics compared to the gilded coasts? I remember reading somewhere that the NYC metro area would have a shrinking population were it not for immigrants, as overall a lot more US born residents are leaving NYC than moving there (and I can certainly attest to Northeast to Southeast migration that living in a sunbelt metro not too far from I-95). As for the Midwest, immigration appears to still be at a lower level than other areas, but it’s a major factor in, at least, metro areas keeping their populations up. And for some small towns, too — rural meatpackers could not exist without them, for example. You can see that Columbus and Indianapolis have fairly comparable numbers and ratios in both native-born and foreign-born growth, though Columbus’ are a bit higher. One note about Elkhart, Ind., which the report notes as having a decline in foreign-born — Elkhart had a boom in immigration in the 1990s that eased for much of the 2000s because the recession hit it so hard. Basically, if there are jobs to be hand, immigrants went to fill them. Of course, it should be noted that much of the Midwest in the last election turned to Trump, and that his anti-immigration rhetoric went over very well in many places, and not just the declining small towns. Because much of the Midwest hadn’t seen immigration of any kind for decades, the last 20 years has been a shock to the system for many whites who suddenly are finding their communities looking very different. Brookings sees some promising developments in Indy, Milwaukee, and St. Louis that might draw people from other regions. In the end, people will only come to a place if it offers something they can’t access in other places.